Houghton Mifflin, August 2009. Borrowed from the library. People call it "the ghost of the mountain." A pale, spotted, almost cloudlike coat makes the snow leopard uncannily invisible in its rocky mountain habitat. People live their entire life among snow leopards and never see one. Snow leopards are as tough as they are beautiful, They survive in some of the harshest, most remote, most extreme habitats in the world. They can live at altitudes too high for trees - sometimes in places with only half the oxygen people need to breathe easily. They thrive in temperatures cold enough to freeze human tears. Snow leopards are rare. How rare, you ask? Well, that's hard to tell. Scientists estimate that there might be between 3500 and 7000 in the entire world, but snow leopards are so hard to spot that this estimate might be completely wrong. Enter Tom McCarthy, a scientist who has dedicated his life to studying and protecting the snow leopard. His work takes him to remote places all over the world in search of this elusive cat. In Saving the Ghost of the Mountain, author Sy Montgomery and photographer Nic Bishop accompany Tom and his team on one such expedition to the harsh Mongolian desert. With her engaging and informative text, Montgomery invites the reader to join them on the journey. First we meet the team, we see how they prepare for the journey, and we stay with them as they climb mountains and hike through the rocky desert, attempting to track the "ghosts of the mountain." Although the main focus of this book is about the science of animal conservation and the study of an endangered animal, Sy Montgomery also provides lots of information about the people and culture of Mongolia. I came away from this book feeling like I had actually been to Mongolia with the team, which is, I'd imagine, exactly what the author was going for. While the narrative follows the expedition, sidebars and spreads examine different aspects of Mongolian culture. 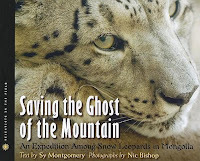 Montgomery also includes information about conservation efforts put in place to help protect the rare snow leopard, most notably The Snow Leopard Trust. The book includes an index and notes from both the author and the photographer. I love the Scientists in the Field series for their unique insights into the work of many different scientists all over the globe. Kids who love adventure and animals will not be disappointed. Pair this with Horse Song: The Naadam of Mongolia by Ted and Betsy Lewin for a further glimpse into Mongolian life. Happy Nonfiction Monday! Go check out the roundup at Wild About Nature. I recently read a Sy Montgomery book about the Moon Bear, and felt like I'd been visiting Southeast Asia, she put so much of the culture and locale into her descriptions. It sounds like this is much the same- and I've always been a bit curious about those beautiful, elusive cats. Thanks for introducing me to this title!